Patrick’s first novel was written as a way of subverting the recently launched Betty Trask prize, which was then solely for romantic fiction. It is an alternative romance in two senses; almost every love affair in it is gay, lesbian or somehow twisted and the narrative alternates between chapters devoted to Seth, a gay schoolboy on the verge of turning sixteen and Mo, a lesbian police detective with the Met. Seth is a musical prodigy, a violinist about to start at music college. As the summer holidays begin he joins his mother and sister at the Trenellion Music Festival, an eccentric Cornish institution his family helped to found. One by one his rash pre-birthday wishes start to come true – his sister is finally revealed as less than perfect, his father absents himself, he gets to play a prominent solo and falls head over heels in love. Meanwhile, in London, Mo is pursuing a romance of her own and may be about to arrest Seth’s unhinged papa. Are new sexual equality laws about to be announced? Pigs might fly. Confident and energetic as novels can only be when the writer has no sense of a public, The Aerodynamics of Pork is now often dismissed by its author as seeming overwritten and under-edited but it remains a cult favourite with his following. Gale’s concoction is irresistible: modern relationships sketched with period charm. I couldn’t have liked it more. 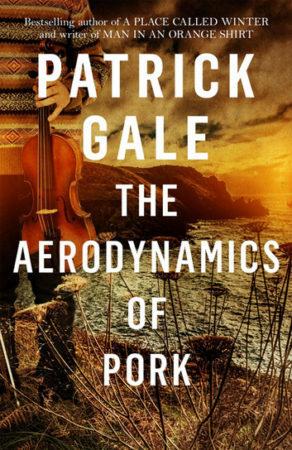 In his first two novels (The Aerodynamics of Pork and Ease) Patrick Gale proved himself a novelist with the enviable ability to project himself almost imperceptible distances into the immediate future and create a glorious fantasy. The lowering of the age of consent for male homosexuals which brings Pork to such a joyous and triumphant conclusion, for example, is an event in itself improbable but totally appropriate within the context of Gale’s fictional world. Plotting, characterization and dialogue quicken the reader’s pace, just as the delicacy of the unfolding love quickens the heart. Gale has a real affection for his characters – this affection he transfers to his readers with considerable wit and skill. Waugh for the 80s. In Pork, the confusion bears fruit. A clever piece of fluff. It is packed with arch dialogue, affectionate caricatures, and the feigned good humour more commonly found in memoirs written by chauffeurs to the famous. A quick thinking book by an author who also has something serious to say.